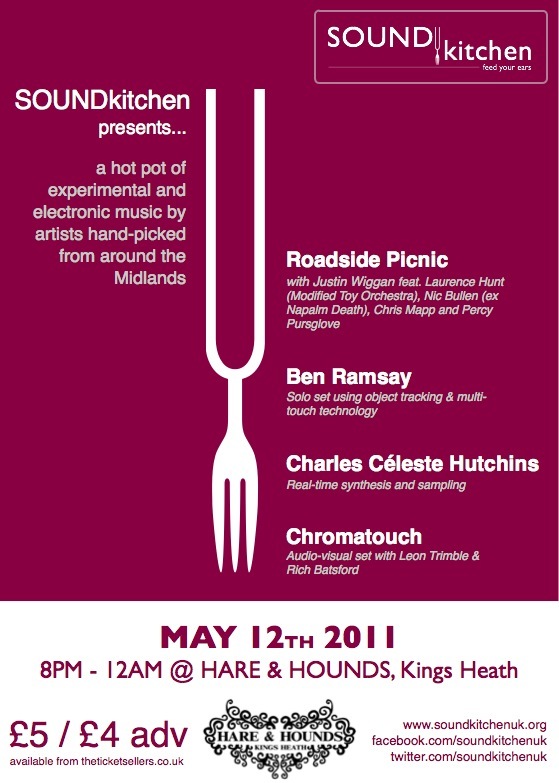 SOUNDKitchen presents… Roadside Picnic, Ben Ramsay, Charles Céleste Hutchins and Chromatouch. SOUNDkitchen returns to the Hare and Hounds with a Hot Pot of electronic and experimental artists from the Midlands. Following in our tradition of new and experimental music we will open the night with a H&H favourite, Chromatouch (Leon Trimble featuring Rich Batsford) who will be presenting a special AV set for us. Charles Céleste Hutchins will be performing a solo set of synthesis and live sampling whilst Ben Ramsay will be using object tracking and multitouch technology to manipulate and control pre-recorded sounds combining field recordings, acousmatic music and IDM. Ending the night will be a rare live outing from noisician Justin Wiggan moonlighting as Roadside Picnic and featuring Chris Mapp, Laurence Hunt (Modified Toy Orchestra), Percy Pursglove and Nicholas Bullen (ex Napalm Death). Previous Previous post: BiLE, 29th of April 2011. Next Next post: Concert hommage à Annette Vande Gorne.